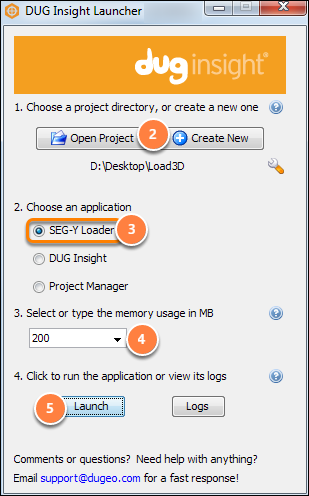 The first step to use the SEG-Y Loader is to launch it from the DUG Insight Launcher. Open the DUG Insight Launcher by double-clicking the icon or, on Linux, running Insight from a terminal. Click Open Project to open an existing project directory or Create New to create a new project directory (see Opening an Existing Project and Creating a Project for more details). Note: As the SEG-Y Loader writes to the database, you must have the write access to the project database to use the application. Select SEG-Y Loader as the application you want to launch. Type or select the amount of memory that can be used by the application. You can type any amount here; you are not limited to the default selections. The SEG-Y Loader does not require much memory; the default 200 MB is recommended. Click Launch to run the SEG-Y Loader. You can go through every step in the SEG-Y wizard by clicking Next. At any step, you can return to the previous steps to make adjustments by clicking Back. See Basic Settings (3D SEG-Y) to begin loading your SEG-Y data. Tip: Click the Help icon at the bottom left of the window to read the help information as you go through the steps. Whether you are using a trial version or a fully-paid licence, we will gladly help you to import your data to Insight so that you will get the maximum out of your data.